View along face of dam from ENE. View of dam from E.
View along top of dam from ENE. View of dam from SE. 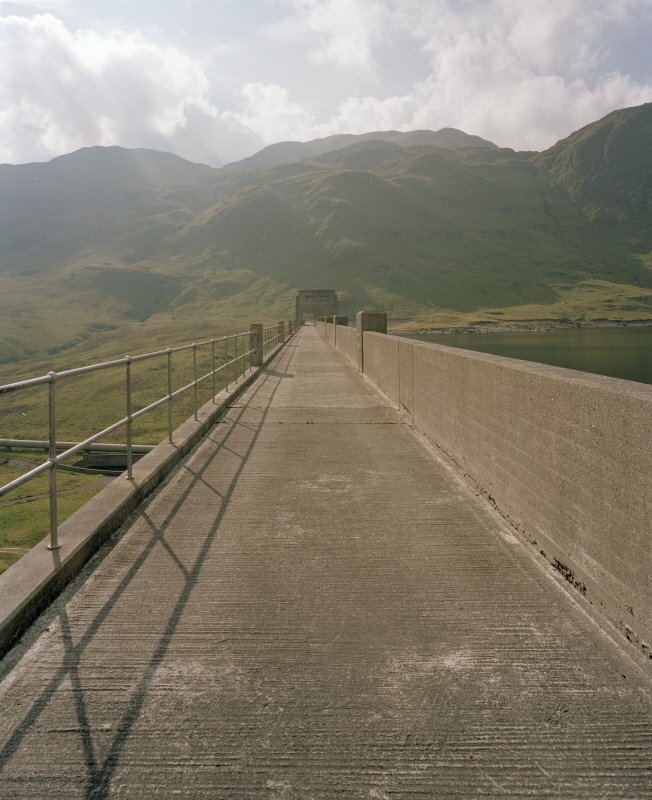 Lawers Dam was constructed in 1951-6 as part of the Breadalbane Hydro-Electric Scheme. The dam is of massive buttress type, and measures 344m in length and 42m in height. It has been constructed across the S end of Lochan na Lairige, whose water level has been raised by 27m. 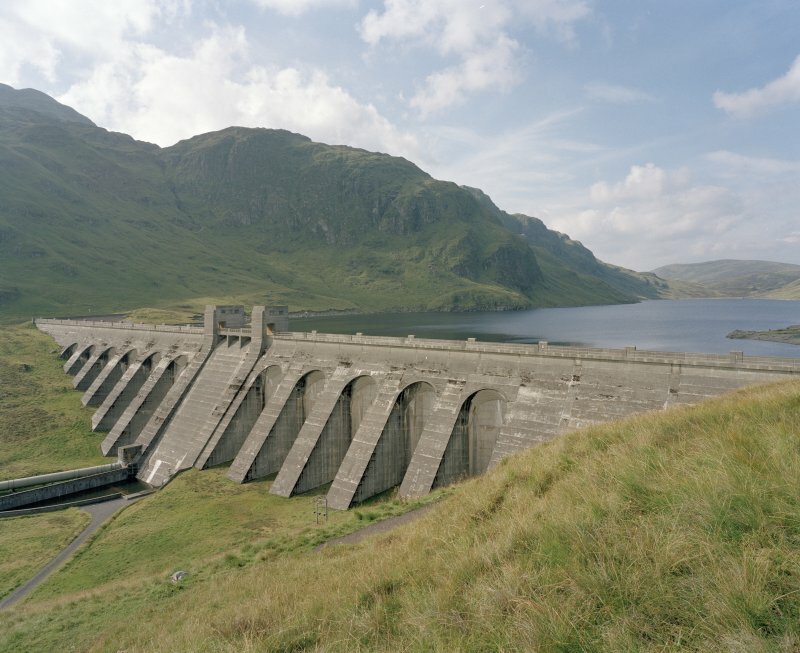 The reservoir is fed by a system of tunnels and aqueducts from a 45sq km catchment area, and from it the water drops 415m to the Finlarig power station on Loch Tay. Payne 1988; G M Ford 2000. The remains of an aerial cableway stretching across the hillside to the SW of the dam, used to transport stone during its construction, are described under NN53NE 39. See also NN54SE 7 for further construction debris at the N end of the reservoir. 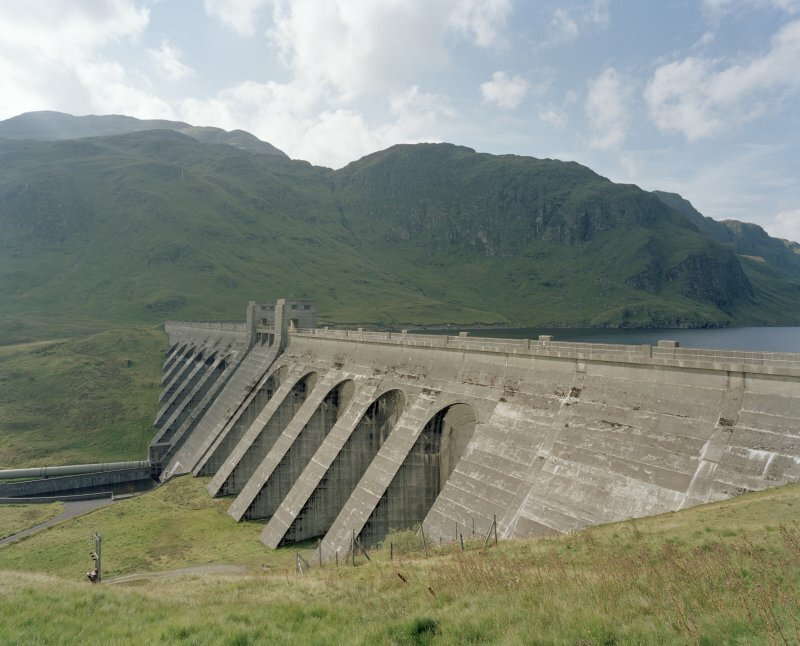 Lawers dam is a large buttress dam which contains Lochan na Lairgie. 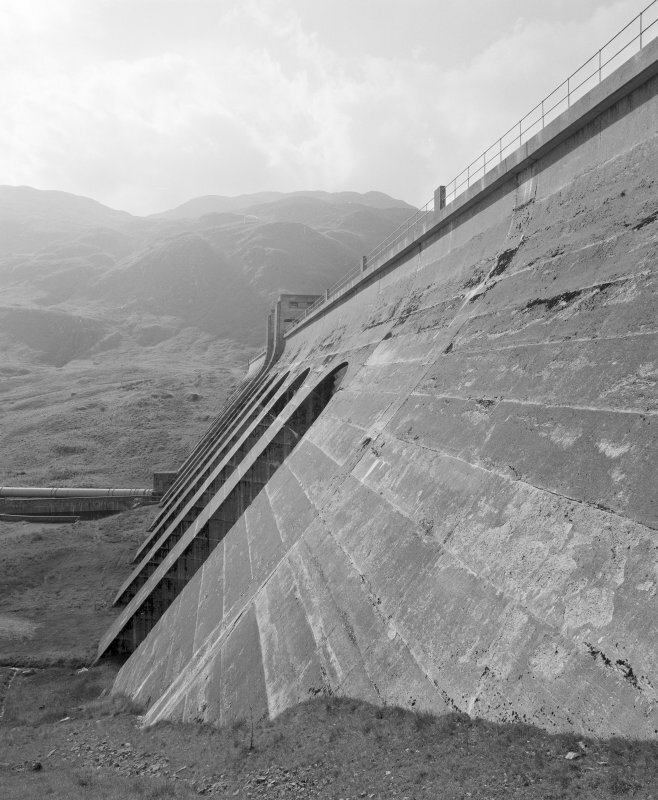 Additional water flows into the dam from an extensive series of catchments spreading behind Ben Lawers. The dam is of similar design to Giorra dam (see separate item) with twin control towers flanking a central fixed spillway. One tower contains a gate to control the dispersal valve the other the tunnel intake leading to Finlarig power station (see separate item). 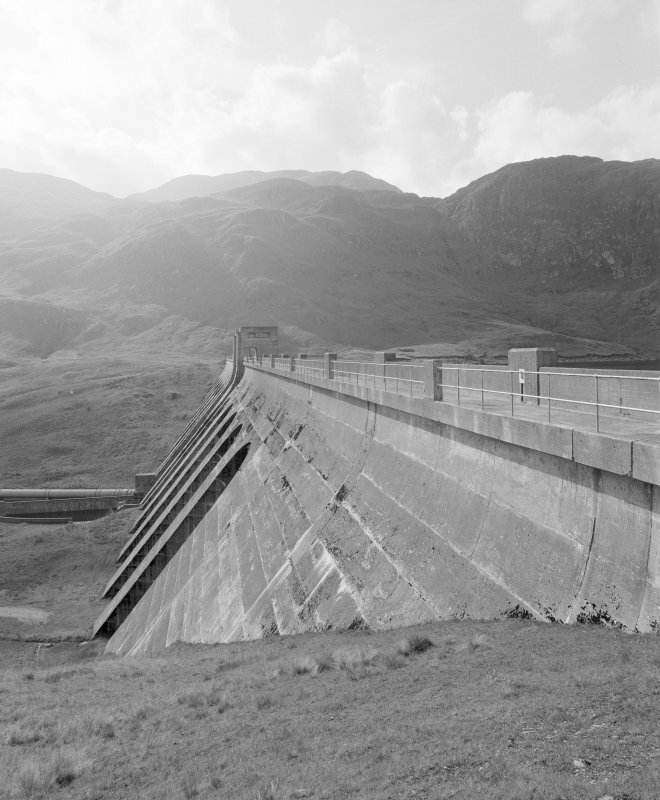 Lawers dam is a large buttress dam located in a prominent position on the flanks of Ben Lawers. 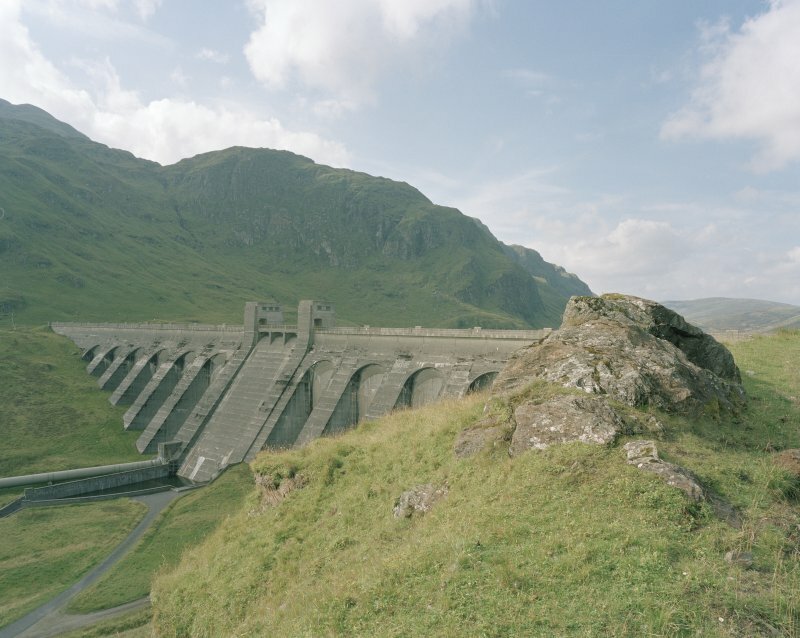 The dam is of relatively standard construction and is of a type characteristic of the design of dams throughout the Breadalbane Scheme. PL Payne, 1988, 24; E Wood, 2002, 50.